Yes, you guessed correctly-today was another spectacular day!!! I slept in and started my day with a walk to the American Consulate in hopes that they will be able to provide me with some information on the Visa process. Well the very pleasant man working there was entirely too happy to tell me that they were closed for the day. Only in Sevilla would the Consulate be open from 10:00-1:00 Monday-Friday! Coming from someone that has been working 18-20 hour days for the past 15 years-this town is looking BETTER and BETTER! I did however, leave the consulate very disappointed. Oh and hungry! I found a very nice tapas restaurant in the heart of Plaza Nuovo and ordered the Carrillada. 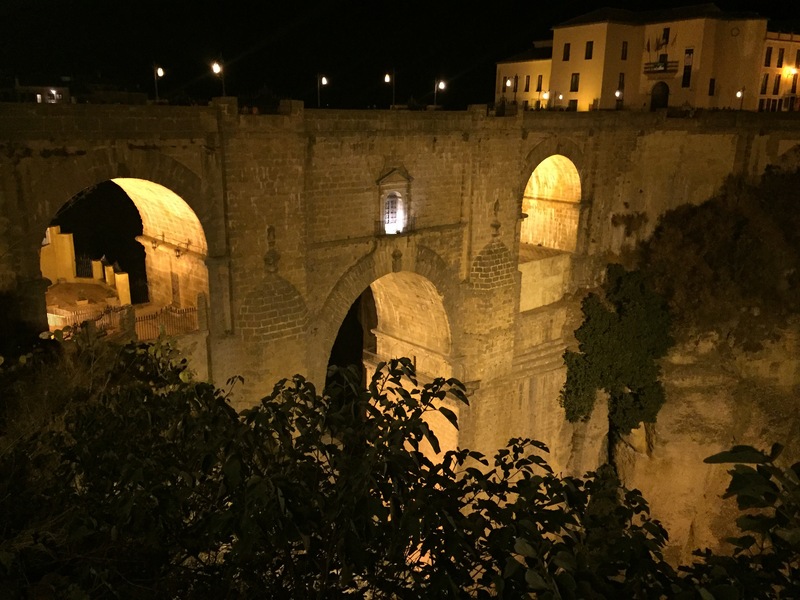 Than I set off on foot towards the bus station in an effort to purchase my ticket to ‘Ronda’. 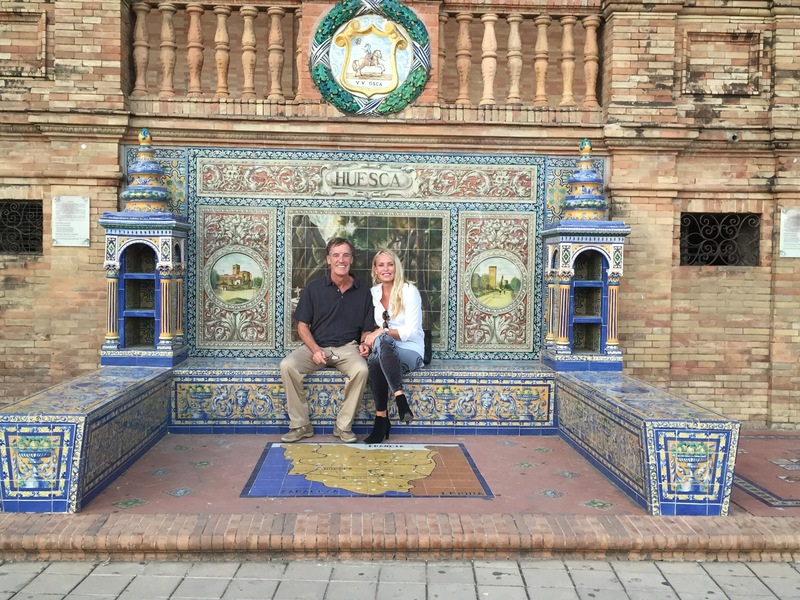 More about Ronda after the weekend. But to give you an idea as to where I’m headed, I thought I’d post these pic’s. Now let’s keep in mind the current conditions I’m dealing with-such as the the fact that it is still 130 degrees! Everything is done in military time, kilometers, Celcius, and all in while speaking Espanol. Oh and I haven’t taken a bus since I was in high school so I’m not even sure if know how to do this back in the Estados Unidos. 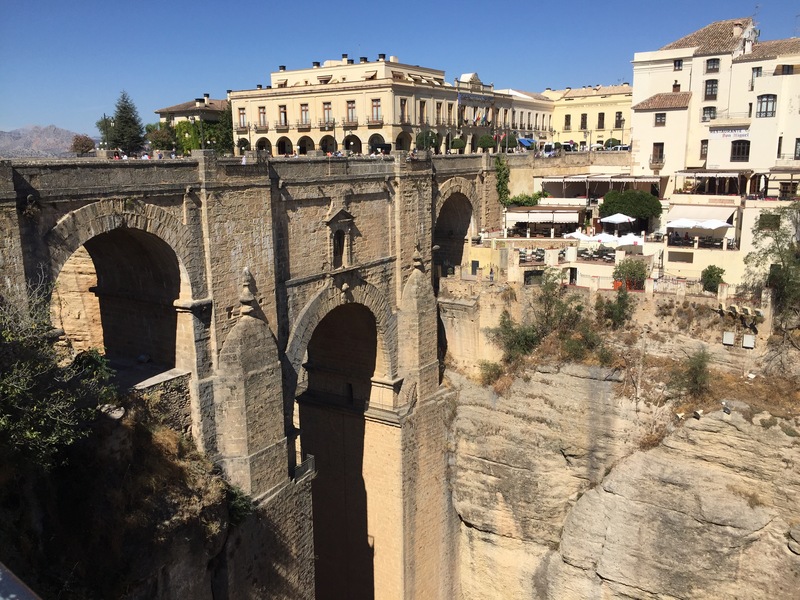 But I do know that I will figure it out because nothing is going to stop me from spending my birthday weekend in southern Andulusia in this beautiful, breath taking town called ‘Ronda’. I managed to successfully purchase my bus ticket and am scheduled to leave at 9:00 tomorrow morning. I head over to see David at the peluqueria to have my hair blown out and than home for siesta. Before dinner I decide to take a walk to Plaza de Espana. The Plaza de Espana is a principal building built on the edge of the Maria Luisa Park. It was built in 1929 for the Ibero-American Exposition World Fair. The walls of the Plaza are tiled alcoves each representing a different province of Spain. And, it is unbelievably beautiful. I arrive home for another one of Gloria’s delicious home cooked meals to find three beautiful Italian girls sitting at the kitchen table.